You must be a member of the Calgary Photography Group to attend this activity. Would you like to join this group? We will drive out to see theProtected content Afterwards we have the option to stay and photograph the sculptures at night and/or to stop in Banff or Canmore for dinner (restaurant suggestions welcome) and return home in the evening. Bring warm clothes, lots of layers! Some snacks for the car, as we'll be leaving at lunch time. And boots with a good sole for walking on ice. Noon-2pm: Protected content We will organise car pooling when we have numbers. As per last year, suggested gas donation for passengers $20. 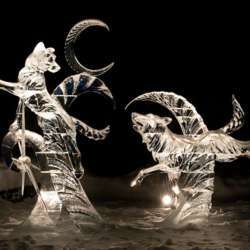 Ice Magic Festival (we can catch the evening light as sunset is 5:20 and earlier in the mountains, and after dark the sculptures are illuminated which gives a totally different look - bring a tripod for night photos). Entry is free on week days. Optional activities: Drinking (at the ice bar). Skating (bring skates). Parking: At Edworthy Park (free and lots of space). Note that the #1 bus comes along Bowness Road (and others).